As I share my new website with you, I’m also taking a deep dive into my last decade and some of the most vital influences in my life. After realising I’ve clocked another 2,000 miles on the surface of the Arctic Ocean I will admit I have an obsession with documenting this ever-changing place. My archives of Arctic sea ice are some of my proudest possessions. But there are many more projects I’m proud to share that don’t involve my face freezing to my camera, like documenting the largest maritime archaeology projects ever attempted, capturing every emotion known to man at the FA Cup final inside Wembley stadium (and bringing the actual FA Cup as my guest to the South Pole! ), and holing up in the most secret escapes in Cornwall listening in on the world’s finest classical musicians brings unheard written music to life. Launching robots into the Black Sea. Documenting fascinating dirt. Witnessing how ROVs play a role in how human civilisation evolved…joining this effort as a photographer for the Black Sea M.A.P. (Maritime Archaeological Project) truly meant “traveling on a journey of discovery through thousands of years from the dawn of mankind to recent history as we explore deep below the surface of the Black Sea.” This was a huge honour. Over the course of two years, my days on the research vessel were to document the science teams collecting data (in the form of mud) that was deposited as sediment up to thirty thousand years ago mud. Kneeling down soaking up sea water through my knee caps and photographing mud, mud with a much bigger story about climate change, why the Black Sea was formed, in the process discovering ancient shipwrecks from up to 450 AD using state-of-the-art deep sea robots. My ongoing love affair with the Arctic Ocean skyrocketed when I collaborated with NASA and the European Space Agency (ESA) in 2017 as part of the 2 Degrees expedition team. While NASA’s Operation IceBridge Orion P3 aircraft flew overhead, measuring ice thickness using cutting-edge radars, we were skiing across the surface of the Arctic Ocean on a transect they provided us to ground truth the data every mile. This means that we were helping to measure what NASA satellites aren’t capable of (although satellites can measure the depth and scope of Arctic sea ice, they are unable to detect the snow to ice ratio). This was all in an effort to better understand our changing polar ice cap and its impact on climate change. After living on the Arctic Ocean for over 360 days, this rare and intimate understanding of witnessing climate change makes everything in me want to help change the story. I am hopeful I will have the opportunity to support organizations like NASA, ESA, and NOAA’s arctic programs more in the future. Standing in front of 100,000 people on the touch line at Wembley Stadium on Cup Final day is nothing short of pure adrenaline. Observing all faiths, ages, colours come together to root for their team and for 90 minutes ride a wave of every emotion known to man, documenting them all as they happen was one of my favourite jobs in the last decade. Sheer rage, weeping, devastation, frustration, disbelief, orgasmic joy, disgust, euphoria–this cocktail of emotion was a fascinating to observe, and a joy to capture with my camera. The most difficult editing job of this entire website was getting that shoot down to a manageable size. Following the adventure of the FA Cup in the UK, I was given the responsibility of a slightly different adventure, when suggesting I transport the FA Cup to the South Pole, but that’s another story for later! Hanging out with the FA Cup and penguins for the day then resting at the posh White Desert Antarctica camp was equally sureal! Endless stories about this–to be discussed over a beer in person! Most wouldn’t guess it, but one of my favourite times of the year is when I am actually sat at my desk, working with the nicest bloke on earth, John Summerton the beauty and the creative genius and brains behind the best adventure volume in the market Sidetracked Magazine. My job has the fancy title of Director Of Photography, which involves selecting the biggest image stories from some of the best adventure photographers on earth. At its core, this magazine is pure heart, adrenaline and adventure–the stuff, just by looking at the page, triggers something inside to spark to life. When I first started editing Volume 1 I had no clue of the richness that would be flowing over the pages over the next 11 issues. It’s a joy. As a photographer I consistently get inspiration from this collection of photographers and expeditioners who always seem to be adventuring further, thinking bigger and pushing limits. This is the cutting-edge of adventure photography. Every single issue seems to be the best one ever, including Volume 11. Behind the camera is my natural territory, but public speaking has become more of a cornerstone of my work as I realize what a powerful tool it can be to reach beyond my typical audience. It’s a chance to get my perspective into the world and I’m grateful for the chance to share another side of what I’ve witnessed and learned over the years. Many talks will focus on my hard-earned lessons of mastering deep cold photography and how to keep my equipment and me alive, but there’s much more. I’m learning that beyond connecting to these faraway places and hearing stories from surviving and being creative in the deepest cold imaginable, most people are interested in my perspective of living for over 360 days on the skin of the Arctic Ocean sea ice and what this unique perspective can provide their business and sustainability commitments. It was a privilege to be the keynote speaker on corporate responsibility, climate change and fashion for PVH Europe for Tommy Hilfiger this Thursday in Amsterdam. Beyond the technical camera tricks, to sharing part of my bigger purpose in my work has been truly fulfilling. Ranulph Fiennes, Reinhold Messner, Wally Herbert, Ann Daniels,: I’ve made a point of seeking out adventurous spirits to take their portraits. I believe portraiture is one of the most challenging areas of photography. I love this combination of limited time pressure and seeking out a moment to capture the essence of a person–it’s as close to visual witchcraft as you can get with your camera. One happy Bulgarian ‘brain box, meet the scientist, Geo Physicist Lyubomira Trendafilova, embracing one of her sediment cores from beneath the seabed of the mysterious Black Sea . In 2015, Lt Col Henry Worsley attempted a solo, unsupported crossing of Antarctica, and before he was able to complete his attempt he was evacuated and tragically died soon after in a hospital in Chile. In memory of Henry, Ben Saunders attempted this solo and unassisted west-to-east traverse across Antarctica known as the Trans-Antarctic Solo. As the photographer for a global advertising campaign for sponsor Canada Goose, I joined Ben and his from Heathrow to Chile to the interior of Antarctica before he officially set off on his expedition at Berkner Island. The responsibility of a global campaign is different while being so far away from civilization and in the highest, coldest and one of the most unpredictable places on earth. I was honoured to work with Canada Goose as they have to choose their photographer carefully, just as I have to choose my equipment carefully. This journey remains unfinished. Here are some outtakes from the global campaign and my impression of legend Herbert Ponting on his head (the official photographer for Captain Scott’s South Pole Expedition) snapped by Ben before he took off! 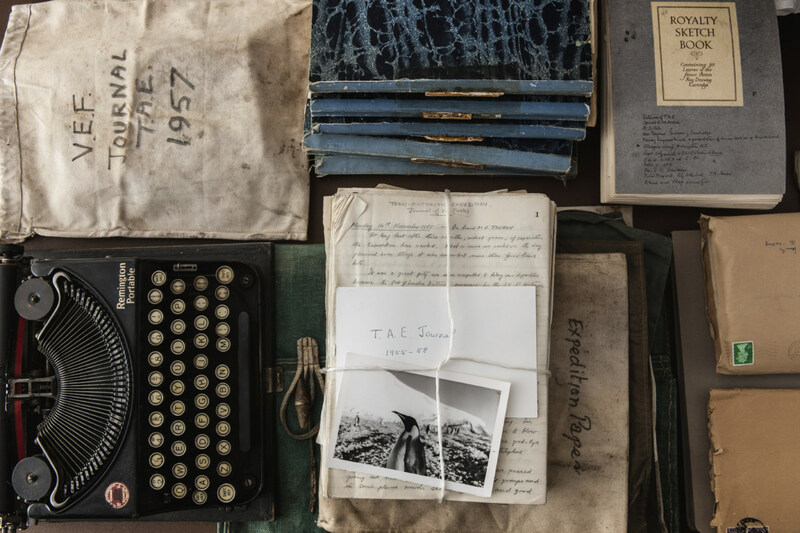 I can’t tell you what it means to lift the top from a dusty cardboard box and smell and see the original words from Sir Vivian Fuch’s notebooks, to see the worn out buttons on his typewriter, to hold his beloved polar goggles and grasp the love and affection that poured out of his brain–it’s preserved history. This is just one example. They go on and on. My photographs are part of Explorers’ Notebooks: The Art of Discovery & Adventure published by Thames & Hudson, a book helping to preserve and celebrate exploration from the 16th century to today. One project I look forward to each year is a labour of love. During the Spring and Autumn some of the best chamber musicians on earth, come together to rehearse music, some of which is so old it has never been heard or recorded since it was first played. In exchange for hearty food and red wine, I get to sit with and photograph the musicians deep inside the thick stone walls of old fisherman’s cottages talking their language of love which is the language of of music. They sit with pencils hovering over pages of notes more complicated than algebra, discussing the character and colour of individual notes, along with the texture as they enter and disappear during the piece. It is pure magic on every level. When the International Musicians Seminar collides with Cornwall each year, a 3-week long gathering of 100 spellbinding musicians, magic spills over into the Pacific and cannot be contained. The connection between music and nature has a synergy only found in this windy sea bashed, deeply romantic, remote location. Which is exactly why the world’s most talented musicians gather here in the deepest and darkest and wilds of Cornwall to create music. Notes flow out of centuries-old farmhouses clinging to cliffs as the waves pound the rocks below and kestrels hover above. As fireplaces crack loudly inside it’s impossible not to think that in an increasingly sterile world, this experience is purely raw and textured life in all its glory. I am beyond chuffed to share these projects and all the epic adventures ahead. I will take a deeper dive into the stories behind these assignments in the journal entries ahead. I hope you enjoy them! Thank you for being part of this journey!